OK, he’s no stranger to Hollywood. He occupied a bungalow on the Fox lot while orchestrating Alex North's film scores (notably Cleopatra); still it’s a shame the film capital hasn't wised up to Henry Brant. His own music never got to stand in their spotlight. But that hasn’t fazed him; at ninety, the composer continues to produce formidable, trail-blazing symphonic works like Ice Field, which captured the Pulitzer last year. And his place in the history books is assured. Consider the specs: friend to Copland, Varèse, Antheil, Cowell and Partch, source of inspiration to scores of musicians worldwide, and the composer of over 100 strikingly original spatial works, a dozen of which incorporate truly massive ensembles. Nope, Brant looms large regardless. It's just that the scope and magnitude of Brant's work, its seemingly inexhaustible creative intensity, its expressive deployment of musicians in space, its fantastic combinations of tonal flavors, and, most importantly, its intrinsic listenability, would seem to make it a prime candidate for big-screen exploitation. As matters stand, though, Hollywood's denial is Innova's gain. It is with unbounded delight that we present the first installment of a great and glorious undertaking: a series of Cds featuring some of Brant's major works, most previously unreleased. 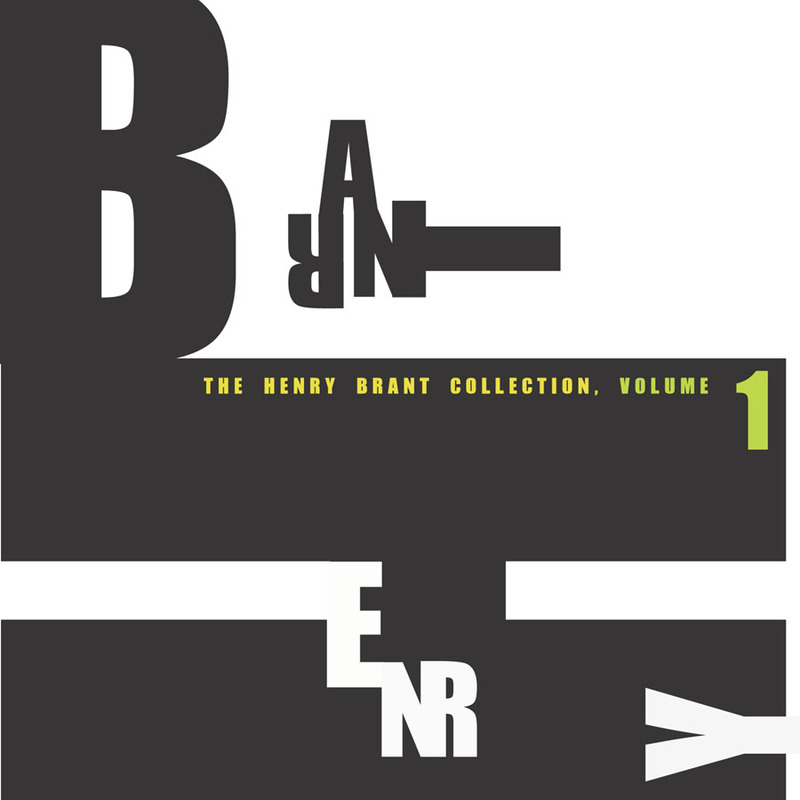 The Henry Brant Collection, Volume 1, a deluxe 2-CD set featuring a pair of Brant's monumental works, Northern Lights Over the Twin Cities (100 mins, 6 conductors) and A Plan of the Air (25 mins, 2 conductors) provides a marvelous introduction to Brant’s world, as well as offering a possible explanation as to why no savvy director has ever latched onto him. His work is simply too big, too rich, too imaginative to serve as mere accompaniment to a Hollywood film. He’d show 'em up. Vol. 1 also includes a monologue by Brant; Handbook for the Spatial Composer, distilling more than seven decades of experimentation into 45 gripping minutes. Mastered by the legendary Teo Macero. The innova label has decided to face down the challenges posed by Brant's music and this first volume of their Brant Collection contains two typically elaborate scores... Titles of individual sections like "Ionized Atoms" and "Pulsating Arcs" recall Varese and Xenakis and Brant's writing is similarly tactile and elemental. However, beyond this he paints another picture entirely. An unhinged jazz ensemble appears from nowhere and swings demonically; a choir of obstreperous bagpipes...a celebratory conclusion for the choir, sounding like atonal Guys and Dolls. Composer Henry Brant (b. 1913) has lived long enough to finally see belated (and well-deserved) accolades come his way, including the 2002 Pulitzer Prize. Brant specializes in spatial music, which is created by the effect of placing different performing ensembles throughout a space. Incidentally, some of these performing environments are quite large; Brant once composed a piece for musicians on gondolas, who traveled throughout Venice by water in order to achieve the necessary spatial effects. Innova’s double CD, The Henry Brant Collection, Volume 1, is an excellent introduction to the composer’s work. The largest composition on the recording, Northern Lights Over the Twin Cities, uses the performing resources of every ensemble of Macalester College. Also included is A Plan of the Air, a work for symphonic band (whose rhythmic complexities require two conductors), performed by students from the University of Wisconsin, River Falls. The collegiate musicians turn in stalwart performances of this evocative and antiphonal fare. What’s more, if you put the first disc in a CD-Rom drive, you get a 45 minute interview with the composer about his creative process in composing spatial music. Craggy, powerful and musically uncompromising, Brant’s music is perhaps the best descendant of such American experimental composers as Ives, Ruggles, Partch and Riegger. Nothing will beat the experience of hearing a Brant work live. I have fond memories of a New York performance where musicians were seated in every place conceivable in the hall: The balcony, the front, the back, offstage, and even behind closed doors in the hallway. They created a glorious counterpoint that, despite physical separation, somehow stayed together and wove a tremendous tapestry of sonic splendor, different to each audience member depending on where they sat! Still, this recording is the best one yet to capture spatial magnificence in two channels. ...listening to this in one sitting feels like hurtling through music history in H.G. Wells' time machine... it's a kaleidoscopic experience but imparted in a judicial manner, so it feels less like sensory overload and more like being lost in a strangely beautiful forest. ...Composition doesn't get much more theatrical (or delightfully weird) than the collected works of Henry Brant. Brant's compositions are dramatic, theatrical and Panavision-sized explorations of noise, silence, melody and randomness. If Ron Fricke made a warped sequel to Baraka with scenes of cargo cults, annular eclipses and nuclear plants on fire, it could be scored by no one but Brant. The Innova Label begins its Henry Brant Collection auspiciously with two large, spatial works that are a must-hear: Northern Lights Over the Twin Cities (1985) and A Plan of the Air (1975). Northern Lights, Brant's magnificent paean to the aurora borealis, employs one orchestra, two choirs, a large wind ensemble, a jazz band, a large percussion ensemble, five pianos, a bagpipe band, and five solo singers, all widely dispersed throughout a large space and requiring six conductors. The performers are asked to wear costumes of their choice. The work was commissioned for the Macalester College (St. Paul, MN) centennial, and in this recording of the premiere on November 23, 1985, the large space was the Macalester College Field House. The ensembles and singers on this recording are listed as the "combined musical forces of Macalester College." Northern Lights is a 96-minute work in 14 movements, each a different character and combination of performers representing a unique and fresh interpretation of the aurora borealis. (Interestingly, movement 12 is 12 seconds of silence.) The text for the work comes from National Geographic magazine and various encyclopedias and astronomy magazines. Brant turns this journalistic and scientific prose into lyrical and sometimes declamatory text and makes them sound like poetry. Plan of the Air was commissioned by the University of Wisconsin, River Falls, for its centennial and is written for widely separated instrumental and vocal groups and two conductors. The text is a poem by Patricia Gorman Brant (1925-2000) after an inventory from the Notebooks of Leonardo da Vinci. The premiere, and this recording, took place on April 24, 1975, and was performed by the University of Wisconsin Symphony Band and vocal soloists, with W. Larry Brentzel and the composer conducting. More practical in its requirements than Northern Lights, this recording is sure to inspire more performances of this work. Innova has also included on this CD a bonus MP3 audio track of Henry Brant titled The Composer Speaks: A Handbook for the Spatial Composer. This is required listening for any young composer interested in composing spatial music. It is also suggested listening for anyone interested in Henry Brant's music.